Now our Police Magnum Pepper Spray with its 2 million SHU formula can be had all wrapped in pink. Make a fashion statement. You don't have to settle for bland colored pepper spray. 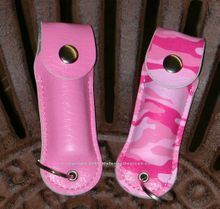 Now it comes in solid pink or pink camo. These pink leatherette cases with keyring are perfect to have with you at all time because they are so small and easy to carry in your purse, pocket, handbag or knapsack, etc. If you use up your pepper spray (its good against dogs and other wild animals as well as thugs) or it expires (2 to 3 years) you can get refills. See below. Solid Pink is now back in stock.